Who needs friends when you've got MONSTERS? When Nelson's beloved big sister goes missing on a school trip, he wants to go and find her. But while his parents join the search party Nelson is left at home with his mad uncle Pogo, a plumber working at St Paul’s Cathedral. In the dark catacombs of the cathedral Nelson stumbles across a strange and ancient machine, designed to extract the 7 deadly sins from a person’s soul as living, breathing monsters. Nelson accidentally extracts the sins from his own little soul and finds himself stuck with seven ugly, cantankerous, smelly and embarrassing new friends who help him form the best (and weirdest) plan ever: they will set out on a quest across the globe to find and rescue his big sister . . .
Are you having a bad day? If so, then you need look no further than this book as it will make your day and then some. It will lift your fantasy spirits up into space and beyond. This book was an absolute joy to read from the very first page. I was utterly stunned to have reached the final page so quickly; I really can't give this book a better endorsement than that. The first thing to tell you about this book is that it is monster bonkers. It's so crazy that I am still thinking what's just happened here. The author leads you skipping merrily through a plot of total mayhem. The language from the start was very cleverly woven into sentences and through paragraphs -the description and the comparisons were like poetry in motion. This could be a skill influenced by the authors time both writing and directing films. He is certainly multi-talented as he has also provided the illustrations for this book. The drawings really capture the tone of the story and make it fun for readers of all ages. The characters and monsters are very special; nothing like you have ever encountered before, in my opinion. Nelson is the main character. He might be considered as a 'normal' young boy on the outside, but on the inside . . . . . well, that is another story as he takes you on the ride of your imaginary life. On the other hand, Uncle Pogo could have just come off the set of Chitty Chitty Bang Bang. He is a wacky inventor who rattles around in your head for some time. 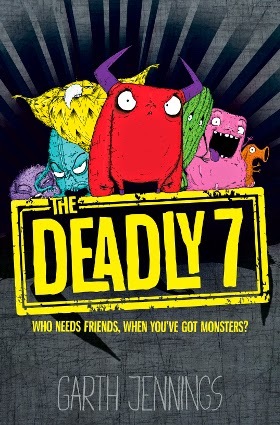 The Deadly 7 are Nelson's monsters: there's HOOT (a golden bird with the wit and charm of a snake), NOSH who is a pink blob and as round as a butcher's belly with warm hands and MISER (a blue egg-shaped monster that shuffles on feet that flop like wet socks). Are you beginning to get the mad vibe yet? The final characters to introduce are Spike, Crush, Stan and MASTER PUFF who can blow you out with his rather windy disposition! The story was brilliant from start to finish; it's a riot of wild imagination. You start off on one journey and then end up on another. You'll find yourself being part of a high speed chase in a limo one minute and then the next you'll be hurtling along on a cow and so on. I really hope that this book develops into a new series. It's original, full of idiotic behaviour and made me smile from ear to monster ear. Five star fun and a smashing adventure to kindle your heart. It's got all the makings of a good film. Make sure that you search out a copy when it's finally published, as you will not be disappointed. Who needs friends when you've got books like this to read!